We are located on the island of Sardinia in Italy. The seaside village of Palau, north of Sardinia. If you fly into Sardinia, the easiest and quickest access is 45 min by car or bus drive from the main airport of Olbia. Other airports are Alghero and Cagliari between 2h30 and 3h30 journey. On request, we can arrange TAXI service for our guests. If you drive into Sardinia, the main ferry arrival port are Olbia, Porto Torres and Golfo Aranci. 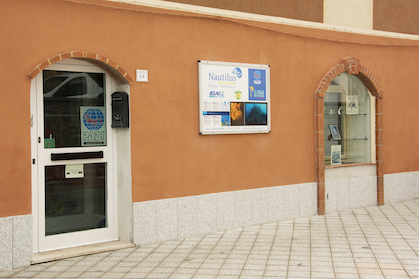 The Diving Center is right in the center of Palau, on Via Roma, a street off the main road (Via Nazionale). Our PADI 5* Gold Palm Resort is opposite the Banca di Sardegna.